Up until the encounter it had been one of my favourite days in the hills so far this year. 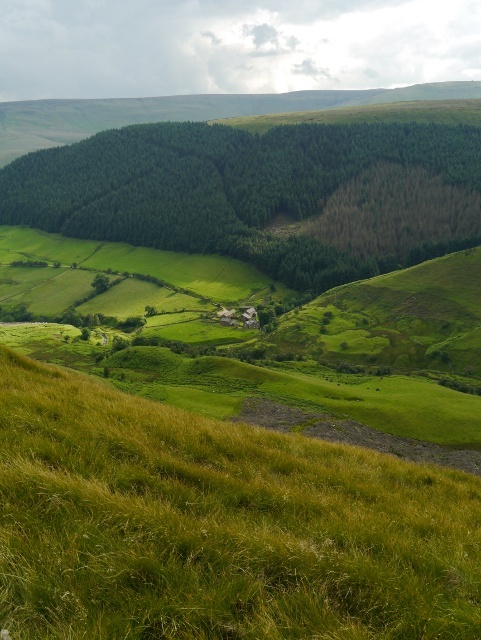 I was wandering the unfrequented tracks of the little known Radnorshire hills in Wales, enjoying the warm sun on my skin. 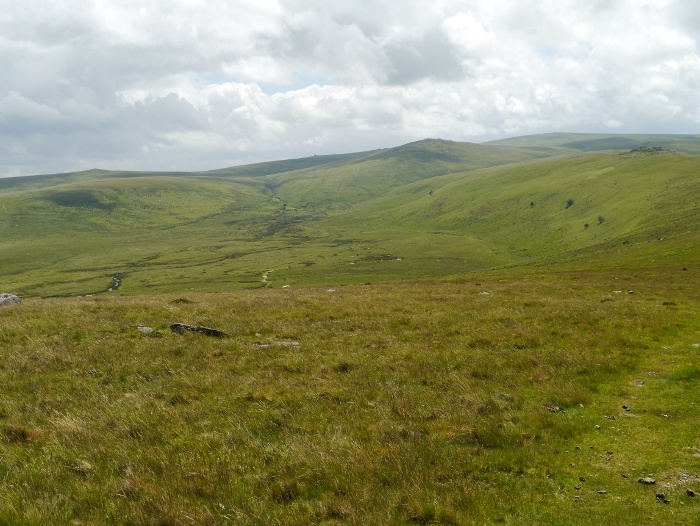 The track onto the moorland plateau of Llanfihangel / Colva hill was a grassy sheep nibbled pleasure. The view across the hidden moorland bowl gave a real remote feel, especially considering the English border was only a few miles away. On the edge of the plateau four figures were watching me approach with interest, their response to my breezy hello as I passed not as warm as hoped. I continued on the track before leaving it to bash through the heather towards the trig point that marks the summit of the hill. On my ascent I heard shouting and turned round to see that it was being directed at me with a flurry of waves. A couple of gunshots from an unknown direction then went off, perhaps they were warning me of shooting taking place? The trig point was now less than fifty metres away so I decided to continue. I spent a pleasant ten minutes at the summit taking in the extensive views. It was just as I was about to leave when a Landrover pulled up nearby and a man got out and approached me with what can only be described as ‘purpose’. “I have just been told that you have been walking across the heather”, was his opening statement. “Yes I was”, was my reply. “Yes I am it’s access land, look here on the map”. I then received a ten minute lecture informing me that you are only allowed to walk across access land if you are on a right of way. I tried to explain that he was wrong in this matter. He helpfully informed me that this is the case on all access land and that any gamekeeper on the moors would tell you the same thing. There was really no point in arguing the point with this chap as he was completely convinced he was correct in this matter. 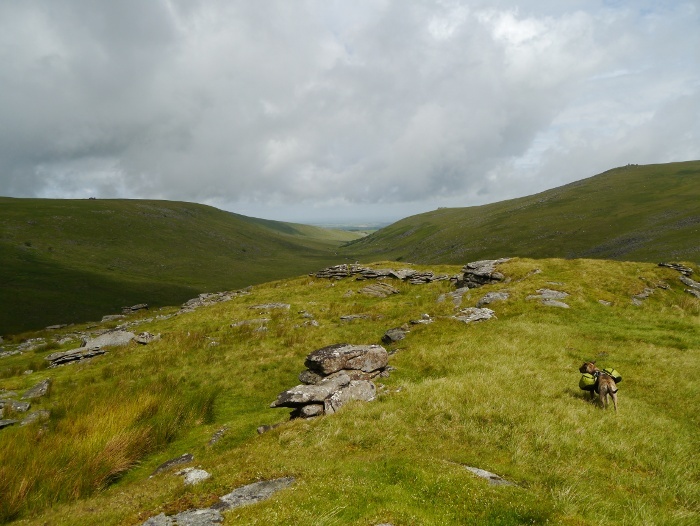 He was clearly pissed off that the area was becoming increasing popular with tourists and that they were getting the overspill from the nearby Brecon Beacons. In his opinion tourism was clearly a very bad thing. With the right of way I needed to get to being a few miles away he reluctantly ‘let’ me continue on my way. 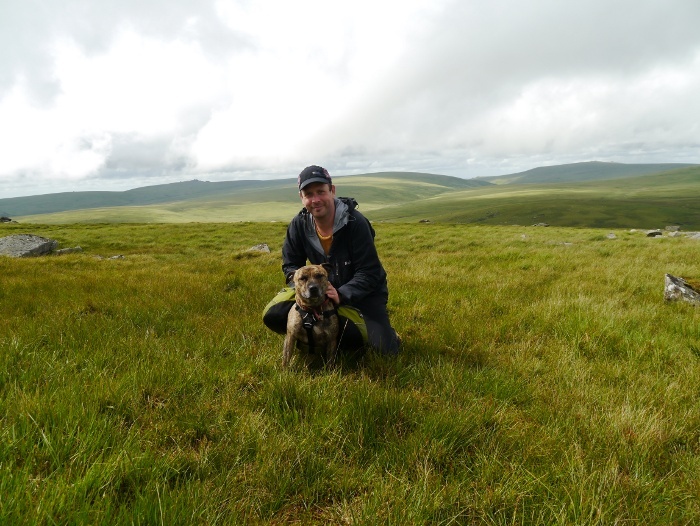 He said that he has to work weekends so that he can ‘educate’ walkers on the moors. 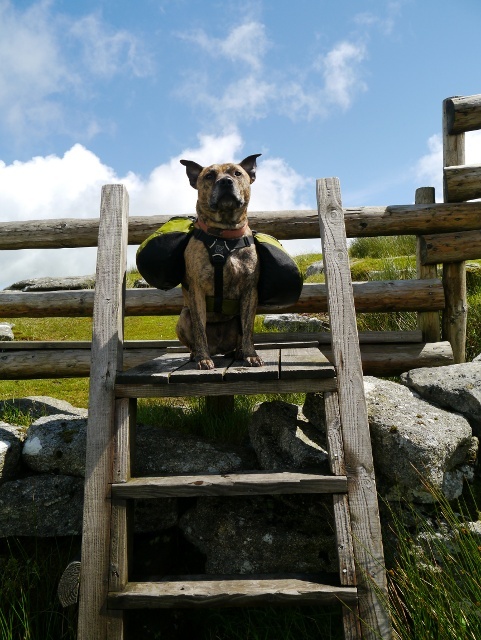 Thankfully I did not have Reuben with me as there is in his opinion only one thing worse than walkers and that is walkers with dogs. I was under strict instructions not to disturb any grouse and give them right of way. He then drove back the way he had come, yes drove, obviously driving a huge vehicle across the heather causes much less disturbance than walking……….. I have to admit that I am not one for confrontation and remained polite throughout the whole situation. Now I am bloody cross and wish I had been more argumentative and stood up for my rights. Some access land can be excluded or closed for certain periods and I was not 100 percent sure if this was the case or not in this instance. 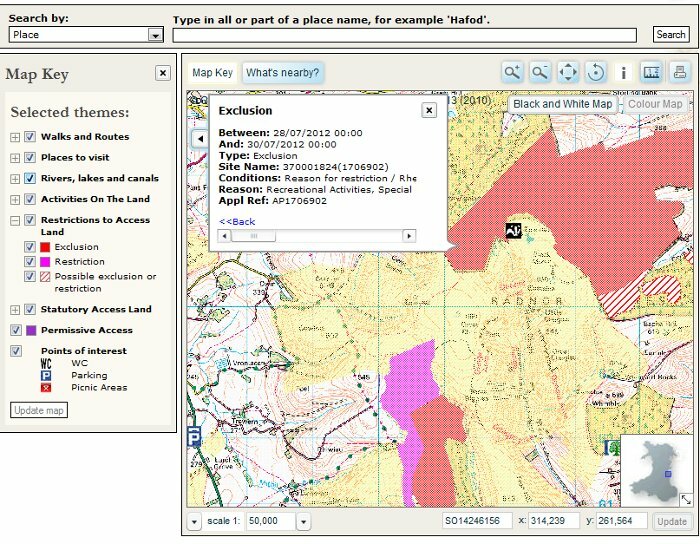 Therefore as soon as I got back I was straight onto the Countryside Council for Wales website to check out the mapping. It showed exactly as I thought, no restrictions to access. The good thing with the mapping on this website is that it will show if there are any specific restrictions in place, the dates and the reason for the restriction. A good example is given below of some nearby hills. I do wish I had checked before setting off as I would have been in a better position to argue my case. Basically he had no right to tell me that I should not be there. It’s the first time this has happened to me in twenty years walking the UK hills. I wonder how often he is up there hassling legitimate users of the access land? Anyone know who is the best person / authority to report the incident to. You can report a blocked right of way but can you report similar issues with access land? A forecast of humidity and a high risk of thunderstorms gave me an uneasy feeling. On two occasions now whilst tramping the hills I have literally seen my life flash in front of my eyes as a bolt of lightning hit the ground in close proximity. I now much prefer the thrill of a storm from the safety of bricks and mortar. A weekend on the Dark Peak moors was postponed, this summers weather doing its best to make advanced planning impossible. It was to be Chrissie’s first backpack since breaking her ankle six months ago. 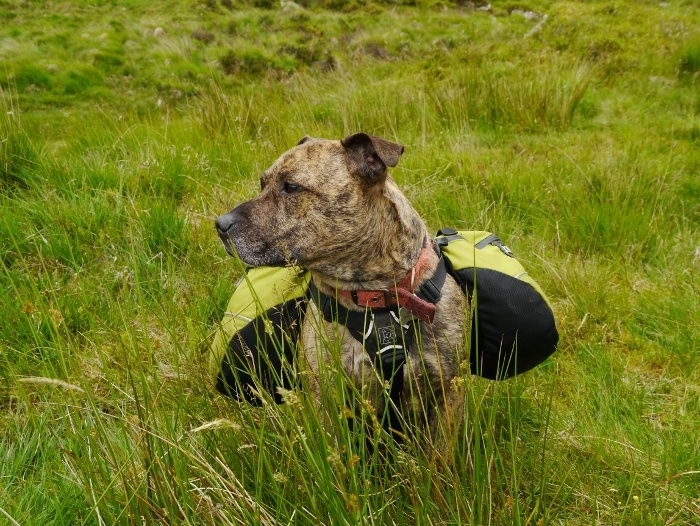 She was keen to return to the hills and give it a thorough testing under the weight of a full pack. A week later I arrived at her house to demolish a sandwich and some coffee whilst Reuben and Tilly raced excitedly around the kitchen. Poor old Dixie was shut away to prevent any canine argy-bargy, Reuben being a visitor to her territory. 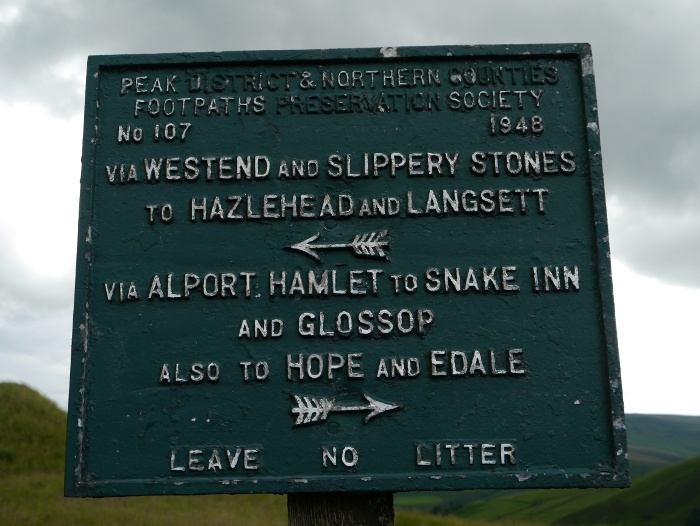 Chrissie’s husband Geoff had gamely offered to drive us across the Peaks and drop us off at Alport Bridge, we would then spend a couple of days walking back to Hayfield. The weather forecast was considerably better than the previous weekend but as we were driven across the Snake Pass dark skies delivered a heavy shower. The rain had not managed to make its way over the Pennine watershed as we left the busy road at Alport Bridge. The situation however quickly changed and we sought cover under some trees to hurriedly pull on waterproofs. The rest of the afternoon was spent playing waterproof trouser roulette. If they remained on the sun would shine warm and bright, remove them and it would tip it down. The track to the farm gave an easy start to the walk, the buildings themself in a picture perfect setting. 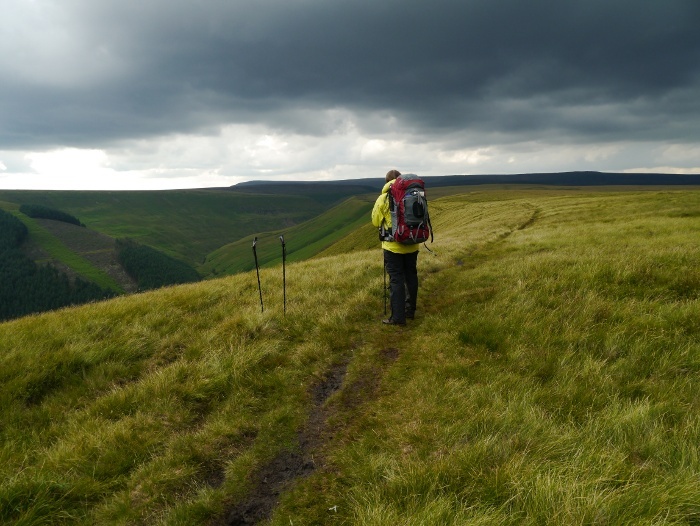 Approaching the bridge over the river, Alport Castles towered above, dark clouds brewing on the moorland plateau. The path upwards was a good one, slowly revealing itself with each zig zag. We were in no hurry and stopped frequently to take in the ever-expanding views. 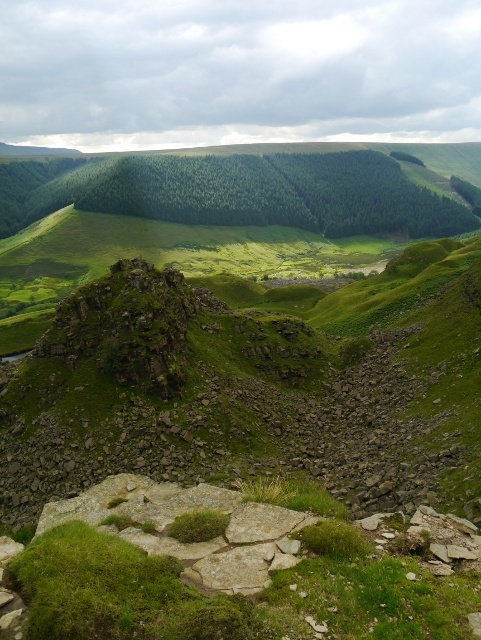 Alport Castles definitely has the ‘wow’ factor and is reputed to be the largest natural landslip in the UK. A grassy ledge provided a natural seat and we sat for a while whilst shafts of sunlight danced on the castle below. One of the gems of the Peaks which is thankfully overlooked by many visitors. A narrow trod took us invitingly into the vast Bleaklow hinterland. The last of the day walkers passed by, heading for the security of the valley. We however were heading towards one of the most remote spots in the National Park. A spot that you will have to discover for yourself and the reason why my descriptions become a bit cryptic for a while. A sudden deluge had us diving for shelter behind a drystone wall to change back into our waterproof trousers. No sooner had we stopped, then so did the rain. The sky was a churning mass of dark clouds interspersed with bright spots. The showers were fast moving and unpredictable but thankfully short lived. 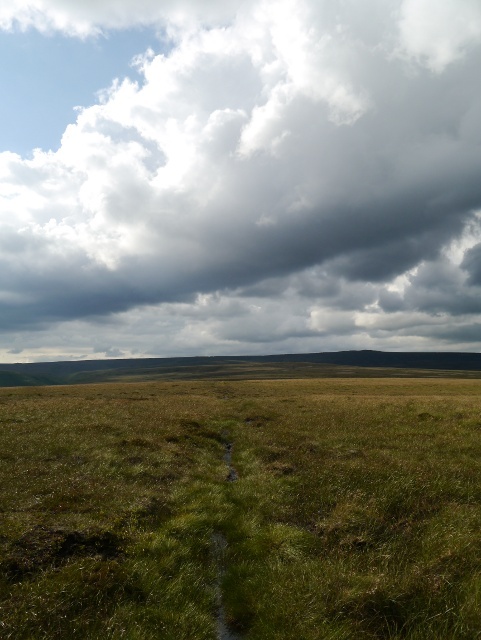 Waterproofs in the end were dismissed but replaced with gaiters as a wade through the bleaklow bogs was to follow. 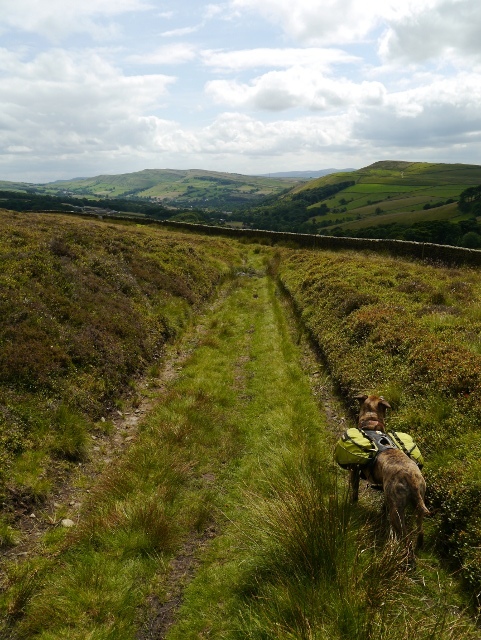 We had a final glimpse down into the green pastoral depths of Alport Dale before heading cross-country. 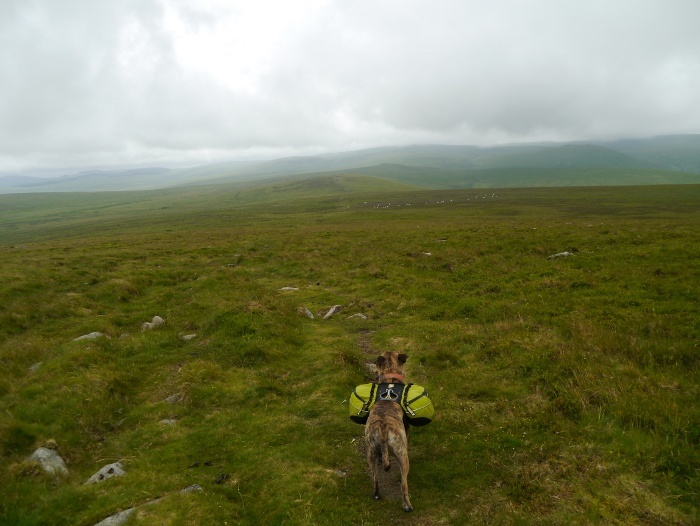 With the wide plateau hiding the surrounding valleys and cloughs we found ourselves in big sky country, clouds boiling above the empty moor. The narrow path soon vanished and was replaced by line after line of oozing peat hags, topped up with months of heavy rain. It was soft going, the peat at the bottom of the increasingly large groughs sucking at our feet. 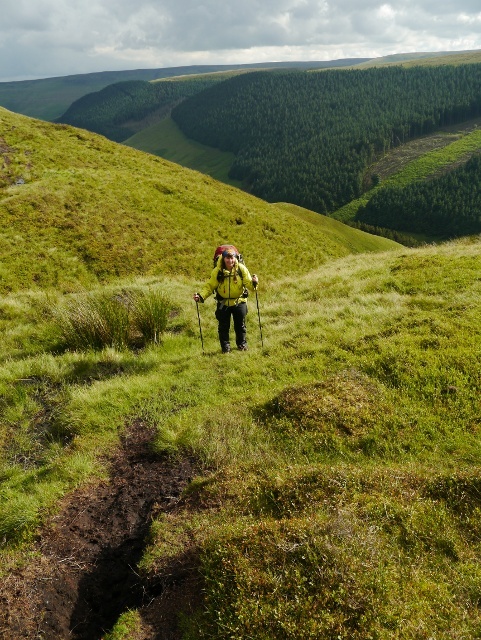 I was keen to escape the peaty morass and led Chrissie towards the rim of the valley to seek out easier ground. 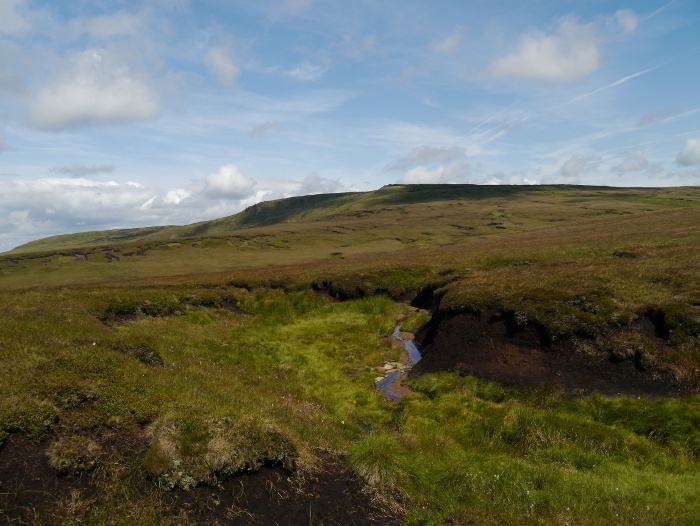 I think of the Peakland moors as a huge cake with sticky chocolate sauce poured on top. The sticky chocolate sauce makes walking pretty difficult. Thankfully the sauce does not quite reach the edges where the going is easier. The change underfoot is dramatic, wet peat replaced by sheep nibbled grass. 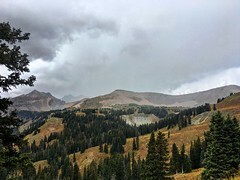 The view was spectacular as well, the rain swelled river tumbling down through a series of interlocking spurs. A perfect spot to sit on a mattress of bilberries and watch the world slowly drift by. A month or so and you will be able to sit and eat this moorland bounty, fingers stained red with the juice of the berries. 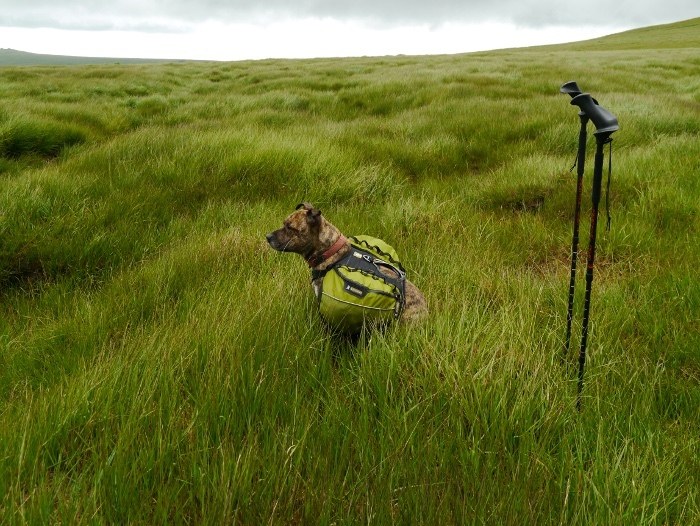 A final slosh across the moors and we descended to our home for the night, a perfect lawn of lush grass. A green oasis in the midst of bog, heather and hags. A shelter was already pitched and occupied by Martin Rye as expected. By sheer coincidence we discovered through twitter that we would be camping in the same spot on the same night. After some chat we all retired to our respective shelters to remove sodden footwear and cook our meals. It is tradition when I camp in this spot to do so in my old faithful Terra Nova Voyager. I don’t know why, but it has found its way into my pack on all but one occasion. I always forget what a pleasure it is to sleep in, a sturdy cosy cocoon. It was in good company with Chrissie’s superlight version pitched next door. 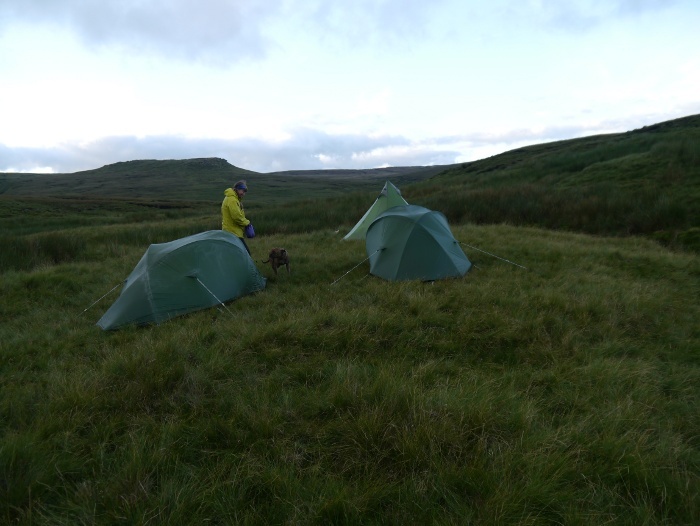 It was a surprisingly chilly evening for July which meant that most of it was spent trying to have a conversation whilst remaining in our individual shelters. Once I remove wet trailshoes I am never eager to put them back on until the following morning. 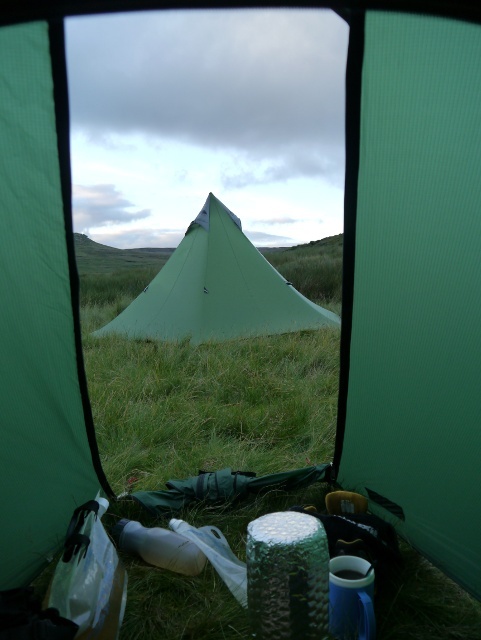 Martin recently did a post called ‘Room with a view’ celebrating the view he had from his new Golite SL3 that evening. My view however comprised almost entirely of his pyramid of nylon, like a neighbours leylandii tree blocking the view from the bedroom window. Reuben however was totally content to snore the night away on his blanket. I awoke at first light to the sound of rain falling on my tent. I popped my head out and was greeted by a swirling grey world, hill fog reducing visibility to a few metres. 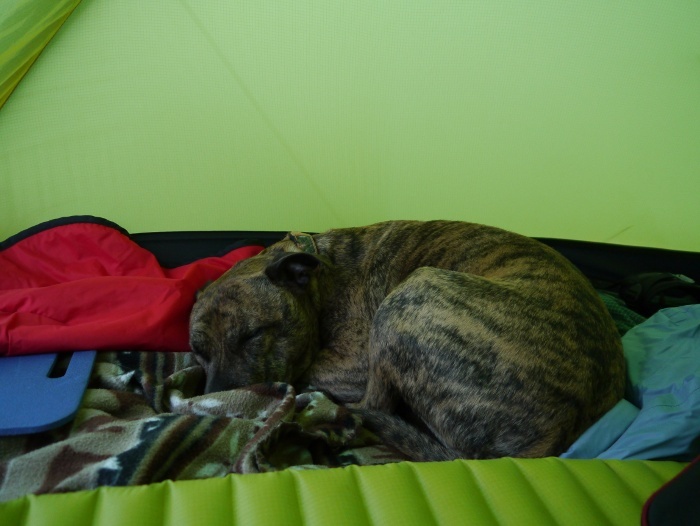 It was nice to snuggle back into my sleeping bag, the hairy and smelly portable tent heater next to me did not stir. A couple of hours later the rain had cleared through leaving a beautifully sunny morning, I could actually feel the warmth in my tent. Probably the first such morning whilst wild camping this year! Martin was already up and packing, I was content to watch from the comfort of my sleeping bag. He soon departed for Hope whilst Chrissie and myself enjoyed a leisurely couple of hours at our camp spot. It was 10am before we finally packed up. 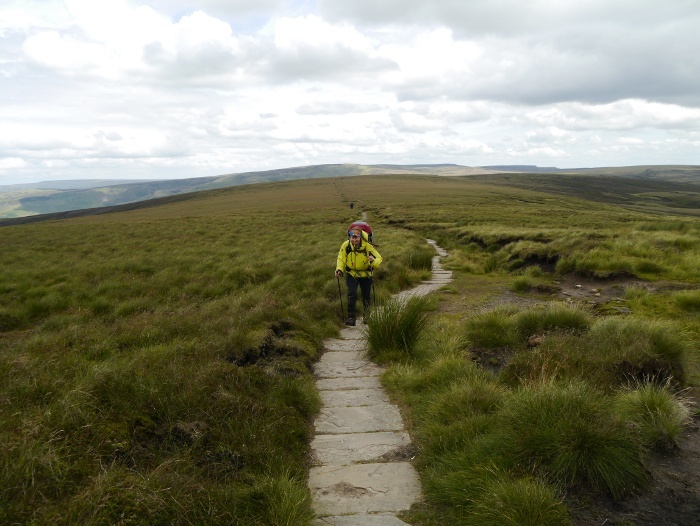 An easy ascent back onto the high moors and we were soon following the familiar Peak District flag stones. These allow for quick progress with very little effort. Over the years they have mellowed with age and the previous erosion scars have healed, vegetation growing back and softening the edges. They are one man-made intrusion that I really don’t mind on the moors. We stopped against a backdrop of the Higher Shelf Stones to fiddle with mobiles that had started pinging away, incoming messages from respective partners. However, panic set in when I noticed a large group of backpackers getting closer and closer. I had to hurry Chrissie to get moving or we would risk getting tangled up within their midst or stuck behind them on the narrow path. Hell is other people. Crossing the summit of the Snake Pass, the splendour of Kinder Scout’s northern escarpment was revealed in all its glory. 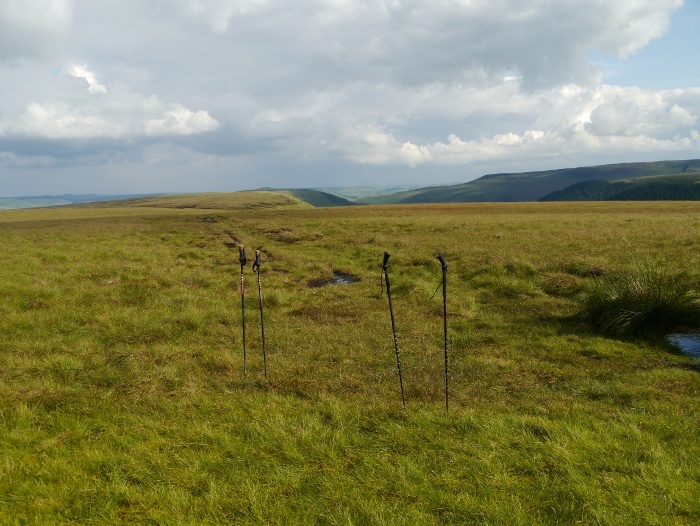 It makes an excellent walk in the right conditions, however Martin reported that it had been extremely boggy the day before. Navigating to the summit of Mill Hill is easy, simply follow the flagstones which snake off endlessly into the distance. Reuben happily trotting along between us suddenly made an unwise overtaking maneuver. 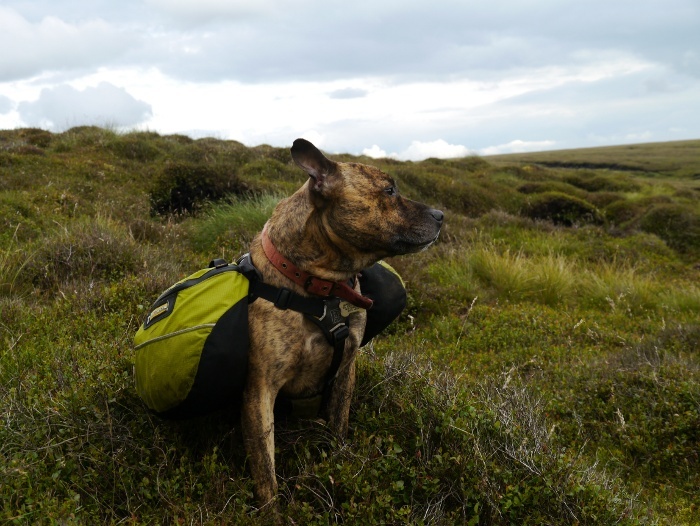 He left the security of the path into possibly the wettest and deepest bog for miles around. Only his head and front legs remained above the surface and Chrissie thought he banged his chin on the flag stone as he went it. Luckily she was right behind him and managed to haul him out, he stood there covered in oozing black peat. The look he gave me suggested that I had done something terrible to him and that it was all my fault. A good shake and the peat was transported onto my trousers. 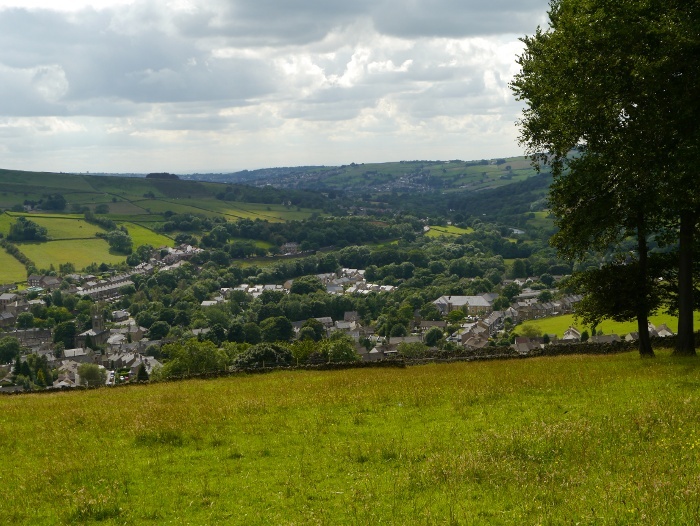 It has to be said that Mill hill is not the most exciting hill in the Peaks, but the views west over Manchester are excellent. We were both ready for lunch but the exposed top did not provide any shelter. Chrissie’s local knowledge however soon had us sitting next to the Liberator wreck, a well placed peat hag providing shelter. A hot lunch of couscous with a cup of coffee was a real treat that afternoon. The path that leads down towards the Grouse Inn is also now paved with flag stones. It must have been very tough walking before they were laid down. We met a man on Burnt hill who had lost his dog, his partner so upset that she had returned to the car. I have to admit that the encounter made me ensure that I kept Reuben even closer to me for the rest of the day. All day a helicopter had been buzzing backwards and forwards over Kinder Scout and we had been speculating what it was doing. It turned out that it was providing pleasure flights from the Grouse Inn, totally spoiling the peace and quiet of the surrounding area. It was a noisy little thing. With more of Chrissie’s local knowledge we took an unmarked path which led to a cracking little spot by the river. A place to sit and relax before the final climb onto the moors above Hayfield. At the shooting cabin above Kinder Reservoir we joined the Snake Path where it soon passed Twenty trees, a landmark above Hayfield. The good citizens need to work on their numeracy skills as there are only 19 of them. It was whilst walking along this easy grassy path that I managed to turn my ankle and hit the ground like an oversized bag of spuds. One of those gritted teeth moments, a minute or so of intense pain which thankfully subsided. It’s ironic really that Chrissie was the one who was doing her first walk since breaking her ankle, yet I was the one to hobble back. Even as I write this five days later it is still rather uncomfortable. Back at Chrissie’s ranch I was refueled on Geoff’s excellent fruit cake before the drive back to Nottingham. Thanks to Chrissie for her company and route planning and to Geoff for providing the taxi service to the start. You can read a different account of the same trip here. I feel that one of the things often overlooked when buying a tent is the pegs they are supplied with. Pretty much without exception they are universally pathetic. Do you really think that a few hair clips are going to keep your expensive piece of silnylon connected to that boggy exposed mountain? 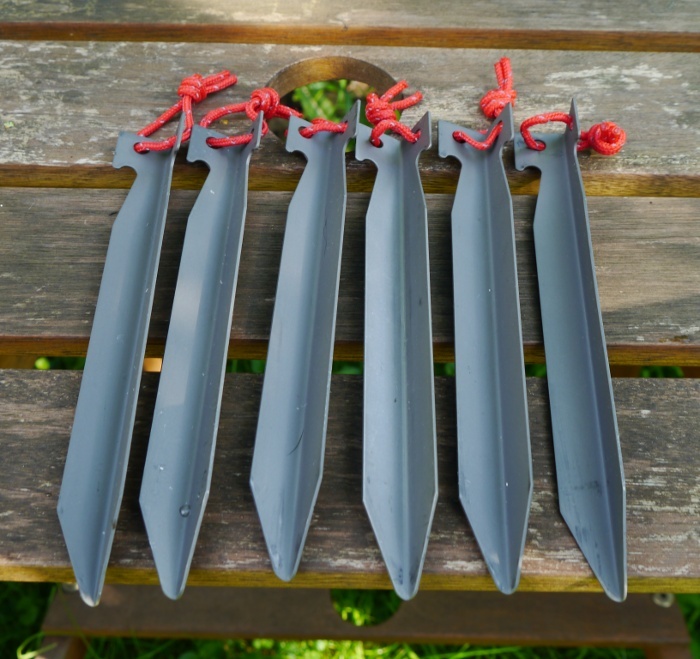 Supplying cheap, lightweight and crap pegs with a tent is a good way however to get the advertised weight down………………..
Over the years I have been searching for the perfect tent peg and think that I have finally found them. I accidentally stumbled across a company called Clamcleats a couple of years ago, discovering the Tornado Titanium Peg. 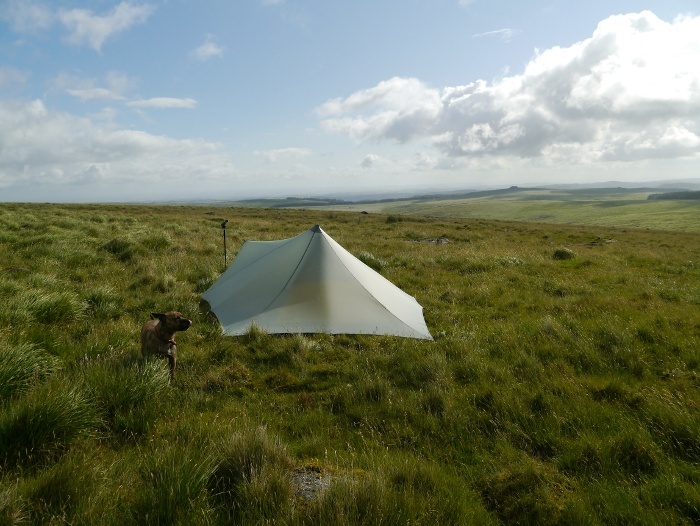 Ever since, they have been keeping both my Scarp1 and Trailstar firmly anchored to various windy spots around the UK. I’m not going to review a tent peg because that would be a bit dull. What I would like to do is give away a pack of six of them worth £21.95 to one of my readers. Simply leave a comment telling me where your dream wild camping destination would be. You can go anywhere in the world, no expenses spared. I will pick out one at random on the 26th July and update this post with the winner. Unfortunately I can only post to an address in the UK. Disclaimer: I have nowt to do with Clamcleats, I’m just lovely. This was a hastily put together backpack with only a couple of days notice. I had planned to be in the Highlands but a lousy weather forecast ended that plan. The south-west appeared to the best bet for respite from the rain with the promise of a dry forecast. In the end I did experience a bit of sun but overall the weekend was much damper than anticipated. 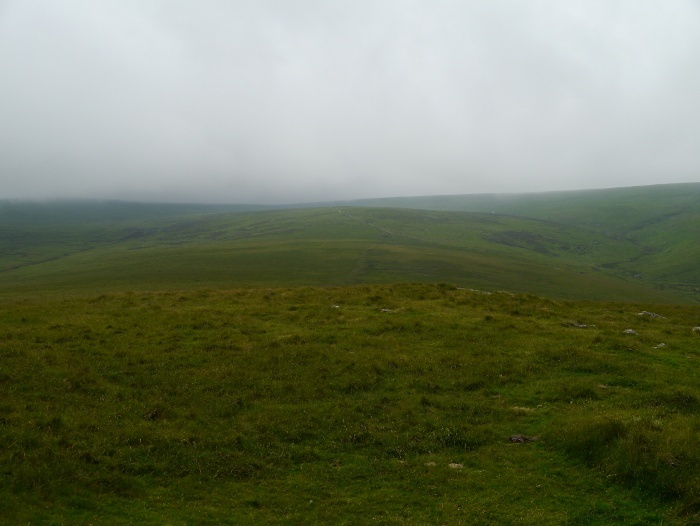 I discovered that Dartmoor can be a bleak and foreboding place when the mist blankets the moors, which it often did with considerable speed. Belstone is one of those rare places which has a large free car park with no overnight restrictions. 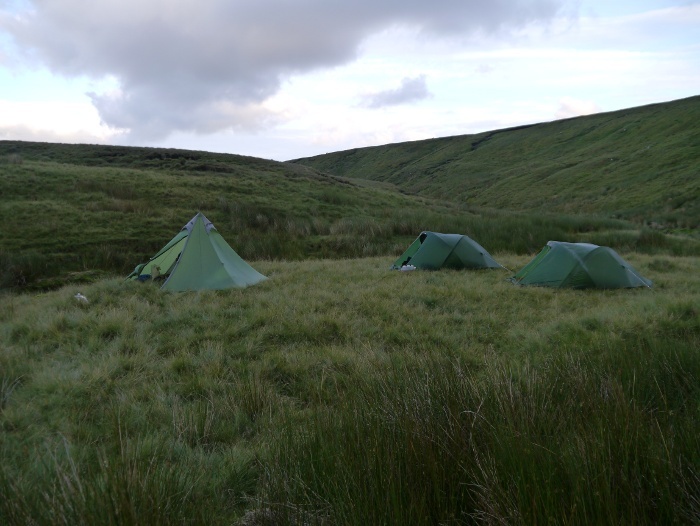 One of the difficulties of backpacking in the hills is finding somewhere suitable to leave the car overnight. Therefore Belstone should be congratulated on being backpacker friendly. I have to admit that I was pretty tired after a 5 hour drive down the motorway and my desire to carry a pack over the moors had diminished somewhat. Reuben on the other hand had enjoyed a long snooze on the backseat, so was eager to get moving. He has now come to realise that wearing his panniers mean good times ahead, so now lets me put them on without trying to back away. We were soon walking through the village which was pleasantly traffic free, another bonus from providing visitors with somewhere free to park. Reuben provided entertainment for the few people out and about in the village, a dog carrying his own kit still obviously a rare sight. 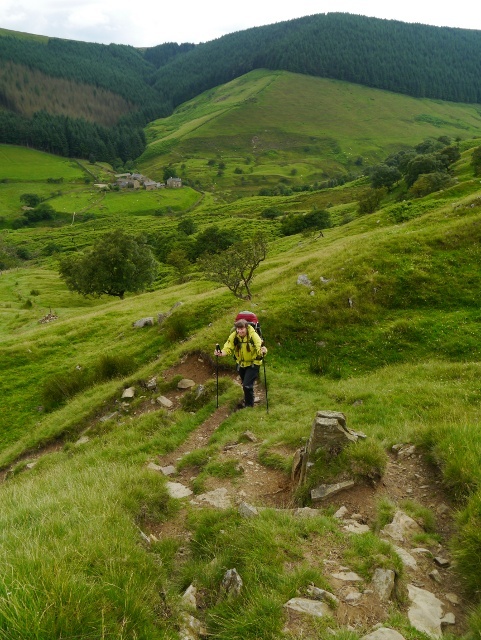 A path led steeply down hill to a bridge over the River Taw, followed by an ascent up the other side of the valley. 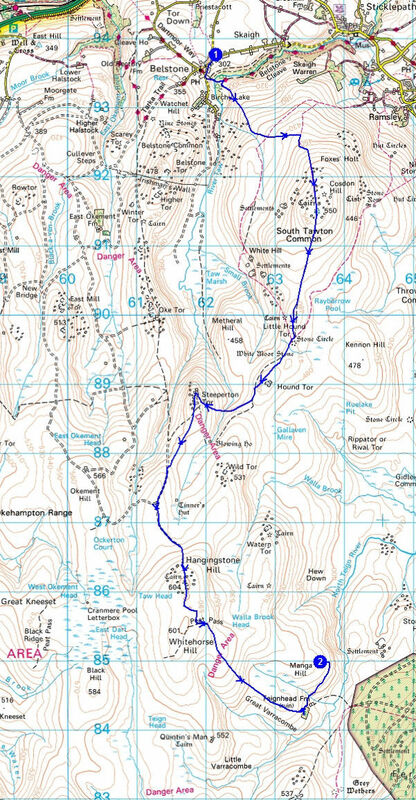 Our first objective was the summit of Cosdon hill, which on the map does not have a direct path marked to its summit. 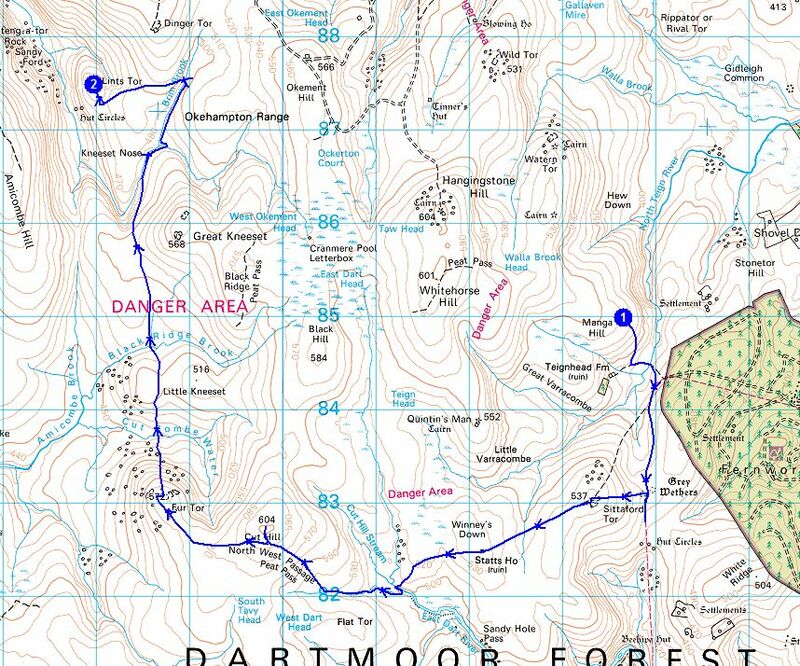 I ended up taking a bit of a convoluted route initially along a path that contoured above the Taw valley until it eventually disappeared. Walking off path on the lower slopes was tough going with low prickly gorse hidden among the lush summer grass. I was glad to find an outcrop of boulders to sit awhile and dig out my waterproofs to fend off a shower approaching from the west. 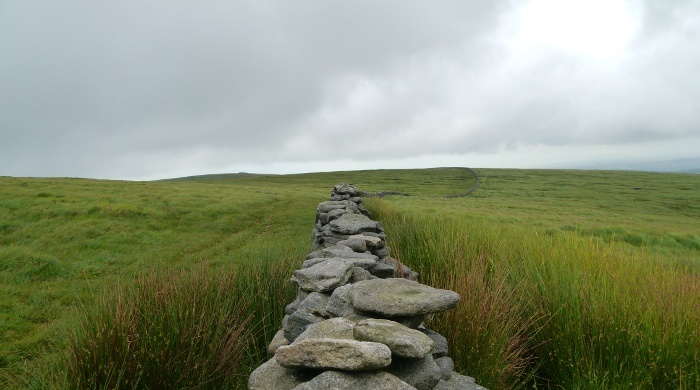 It was a bit of a dull trudge to the huge cairn on the summit of Cosdon hill. This provided a bit of shelter from a heavy shower whilst the bottom of a cloud briefly enveloped us. To the west, the higher summit of Yes Tor was firmly stuck in the clouds where it would remain for the rest of the day. 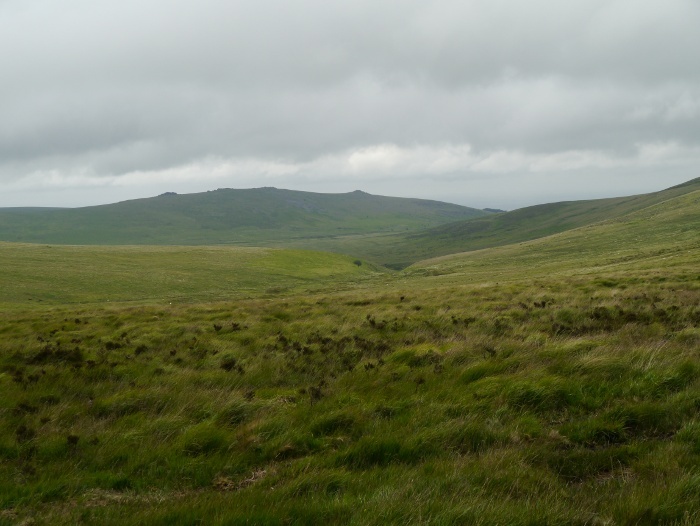 We followed a well-defined path down the southern slopes of the hill, the huge open expanses of the north moor rolling towards a cloud covered horizon. 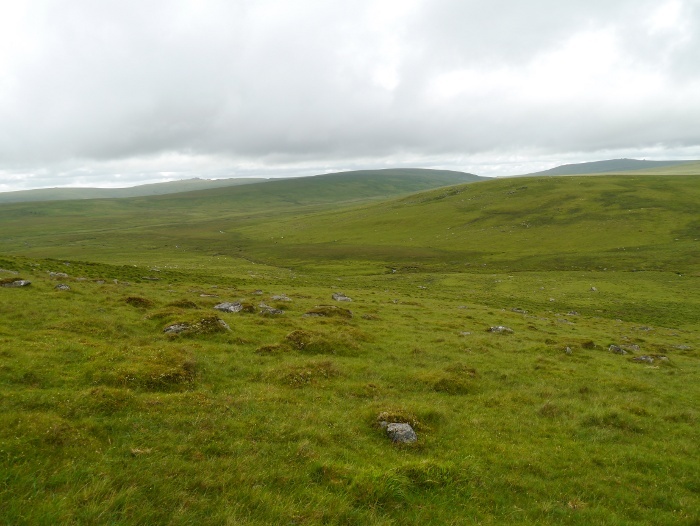 Progress was rapid and we passed a stone circle I had not noticed on the map, a point of reference on such a large open landscape. One of the overriding impressions of the weekend was the sound of the wind blowing through the long green grass. 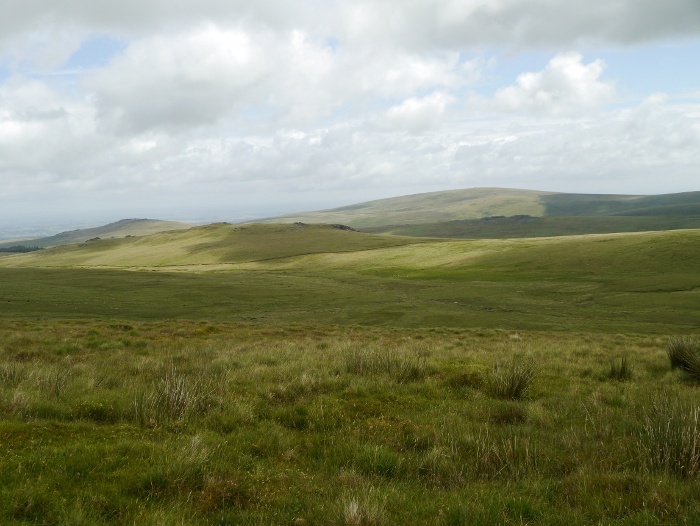 I have only ever visited Dartmoor in autumn or winter when the moor is covered in every shade of brown. In summer it is surprisingly green and lush, swirling eddies causing patterns to ripple across its surface. 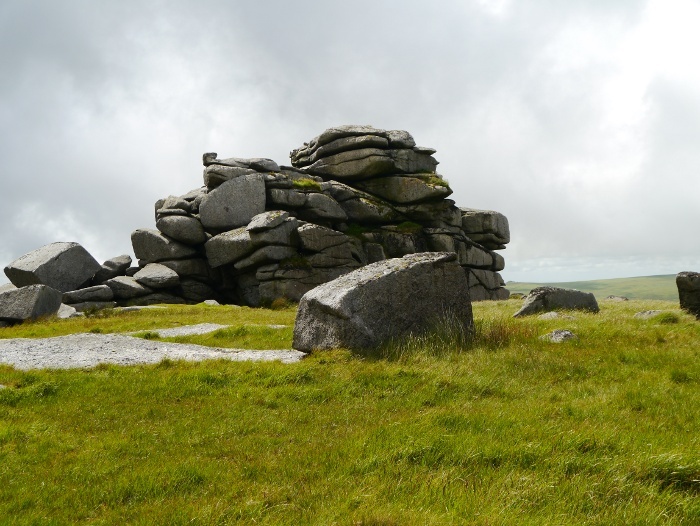 I felt it only apt to taken Reuben to Hound Tor but on closer inspection it was clearly off-limits. A gang of cows had taken up residence, like teenagers in a village bus shelter. With a dog in tow I felt it best to give them a wide berth. We left the main path and descended to Steeperton brook, an oasis of calm sheltered from the wind. 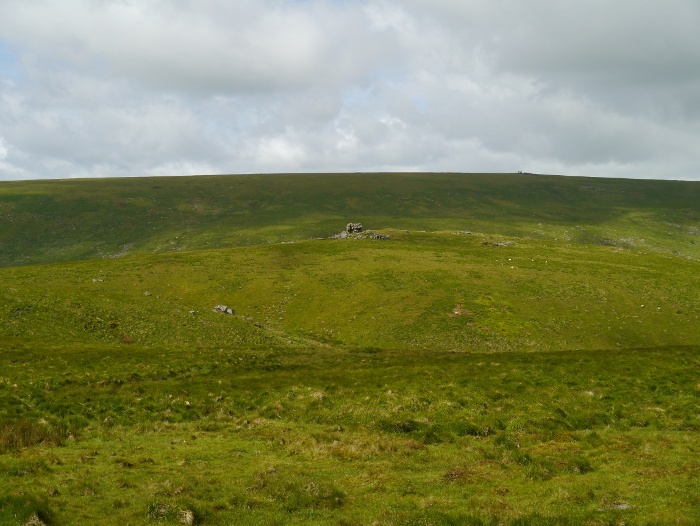 It was an easy climb to the summit of Steeperton Tor which was occupied by a herd of ponies and a tiny foal sheltering next to the army observation post. The view to the south had become even bleaker, Hangingstone hill our next destination hidden in the murk. Luckily a firm track took me almost to the summit as I was soon walking through heavy wind-driven rain, thick mist reducing visibility to a few metres. In the rubbish conditions the summit which is adorned by an army hut was a bleak and uninviting spot and I did not linger. I mistakenly could not be bothered to take a compass bearing and soon found myself floundering through a marshy area south of the summit. 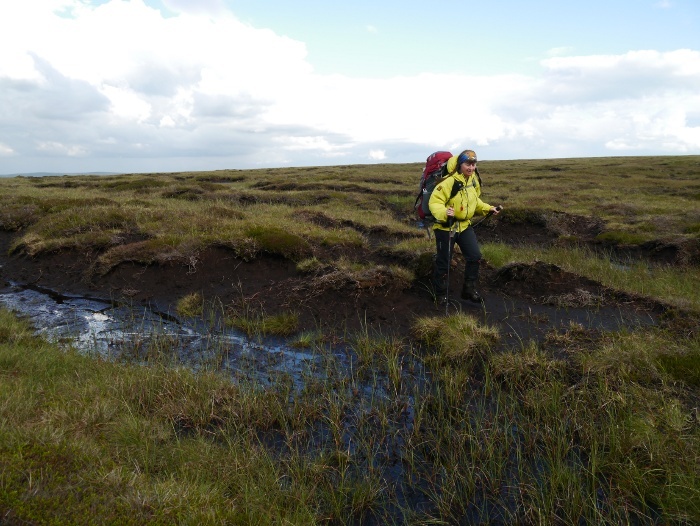 I turned due east and picked up a path through the worst of the terrain before finding the remains of a Peat pass. I soon had to leave this and head into the mist across rough, boggy and tussocky terrain. I was relieved to come to the wall marked on the map where I could just make out the tops of the trees surrounding the ruins of Teignhead farm. 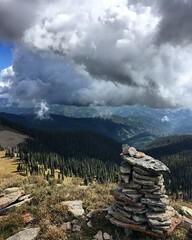 The going continued to be tough until just above the farm and I was looking forward to seeking shelter there and pitching my tent. 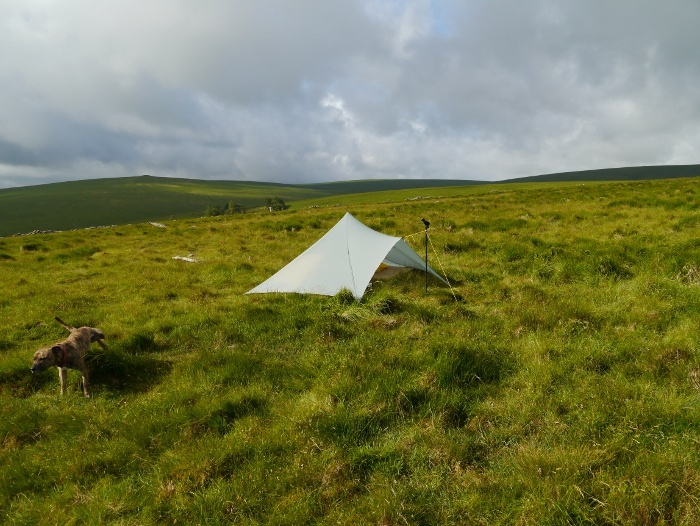 Robin had found a great spot there on his backpack across Dartmoor and it was somewhere I was keen to wild camp. I was therefore extremely dismayed to discover that a large herd of cows with calves in tow had occupied the area, the air full of their bellowing. There were also a couple of tents bravely pitched in the exact spot I was after. There was no way that I was going to risk camping near cows, especially with a dog. Feeling wet and bedraggled I filled up with water from Manga brook and headed up Manga hill in the hope of finding somewhere to pitch the Trailstar. After half an hour of trudging about I settled on a spot that was passable, although rather exposed and windy. Reuben was told to wait whilst I pitched and he looked on like I was the worst owner a dog could possibly have. With shelter finally provided he took to his mat with a big sigh and did his best to ensure that I knew he was not very happy with the whole camping in the wind and rain thing. It was a noisy night with the rain hammering on the nylon a few inches from my head. I was glad that I had re-sealed some of the upper seams which had stretched with use. 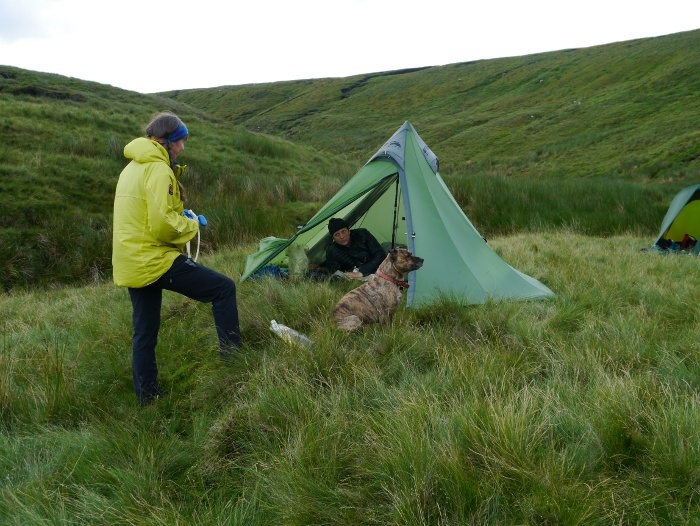 I was pleased that the Trailstar provided such a stable shelter in an exposed position in some pretty nasty conditions. I received a text from Corrina informing me that it would be a dry and sunny morning before showers developed later that afternoon. I read the text in the morning whilst the rain continued to hammer down! I festered for a while until the sun made a brief but welcome appearance and I exited to take in my surroundings and get a few photos. Reuben took the opportunity to do what dogs do. Rain soon had us diving for cover and I cooked and packed whilst waiting for the next sunny interlude. The day ended up being one of fleeting sunshine in-between some very hefty showers, mist quickly enveloping the hills. It felt like the conditions changed every few minutes, a day when by the time you managed to get your waterproofs off it would start raining again. I ended up keeping them on all day. Packed up I looked down upon Teignhead farm and noticed that the cows had dispersed across the lush pastures making me glad that I had not camped in the vicinity. 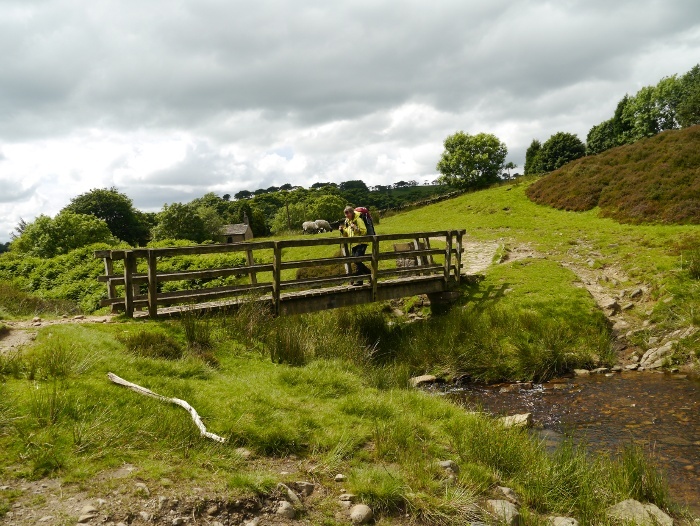 Crossing the North Teign river I followed a bridleway with excellent views back towards the ruin. It must have been a very isolated place to live. 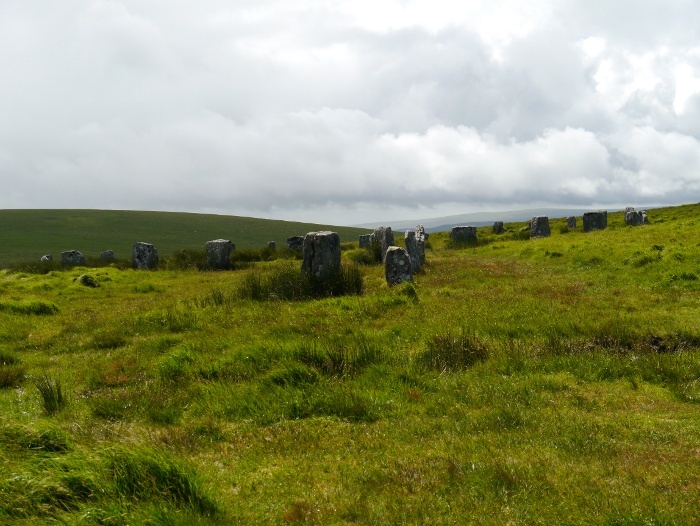 The Grey Wethers stone circle is rather impressive and I reached it just as the sun came out. 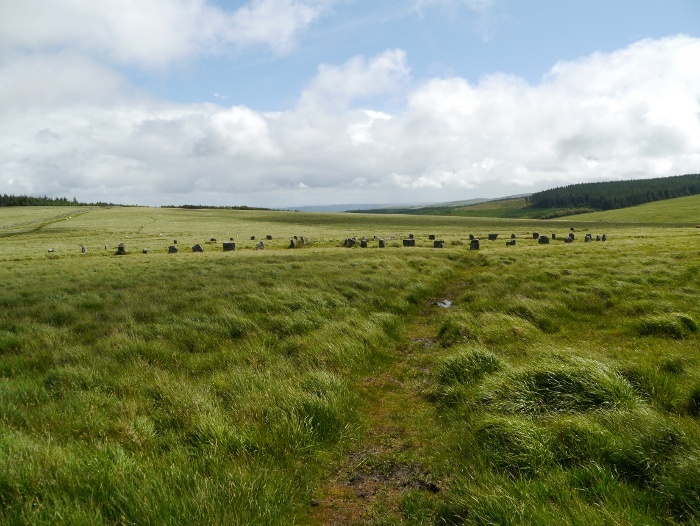 This lead me to re-naming it the ‘Bill Withers’ stone circle due to the fact that I found myself humming along to the tune ‘lovely day’…………….. 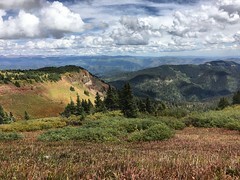 I had originally planned on bagging White Ridge which is a Dewey but from a distance could see that it was already occupied by cows and their calves. 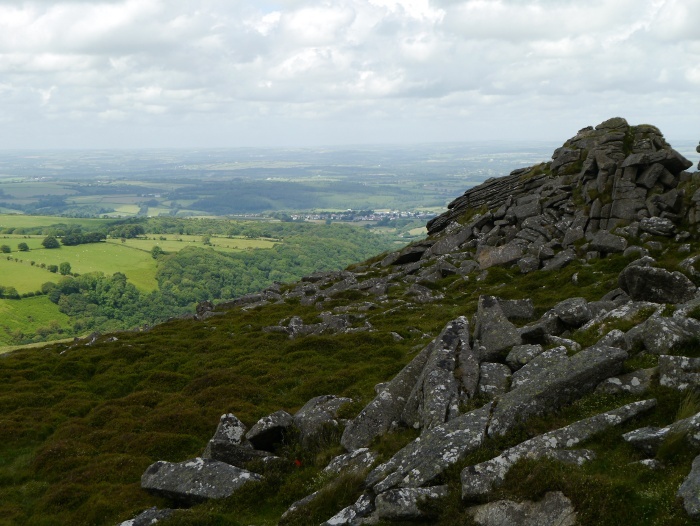 Therefore we headed directly to the top of Sittaford Tor with its extensive views. Although not marked on the map a path leads directly to the ruin of Statts House on Winney’s Down. 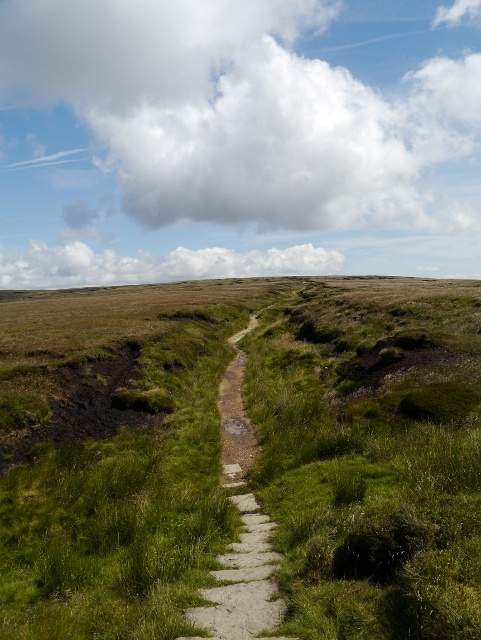 This path crosses an area where a stream runs through an extensive boggy area. There was a disconcerting moment where I was walking on quaking ground, a raft of vegetation floating on water. If you stood still for long enough you would slowly sink and possibly never be seen again! On the other side of the bog we suddenly found ourselves standing between a young foal and its mother. I quickly leashed Reuben as the foal made a whinny sound and trotted a huge circle around us to get to its mother. She continued grazing as if we were not there. Thankfully the path up to Statts house was firm and dry, Reuben immediately seeking shelter behind one of the ruined walls. It was a good spot to pause out of the wind for a while and watch the clouds racing across the sky. 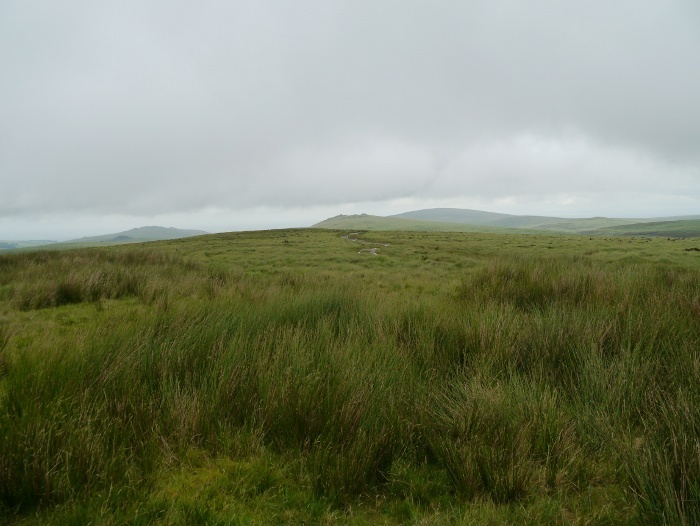 Our next destination was the summit of Cut Hill which looked brooding in the distance. 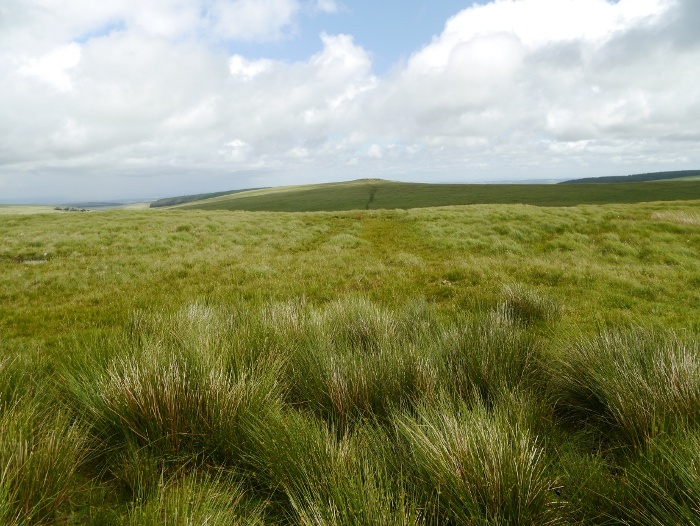 We sloshed across the moor and descended to the marshy banks of the East Dart river. With already saturated trail shoes it was easy enough to simply wade across, no worries about trying to keep my feet dry. We followed Cut Hill water upstream for a few metres and found a boulder that provided shelter from the wind. An ideal spot to sit for a while and get the Jetboil out to make coffee and cook lunch. We followed the stream for a while before striking up across rough ground towards the unseen North West Passage. 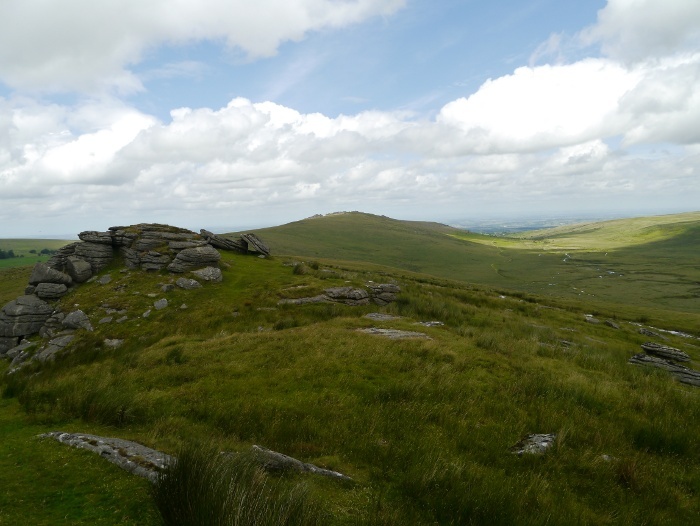 During the climb we intersected two backpackers who were making their way between Okehampton and Princetown. It was quite strange passing others in such a remote spot, like two tiny boats passing on a huge ocean. They commented that I was heading into bad weather, the sky ahead quickly darkening and looking bruised and angry. A beer at the Plume of feathers where they were planning to camp seemed to be spurring them along! 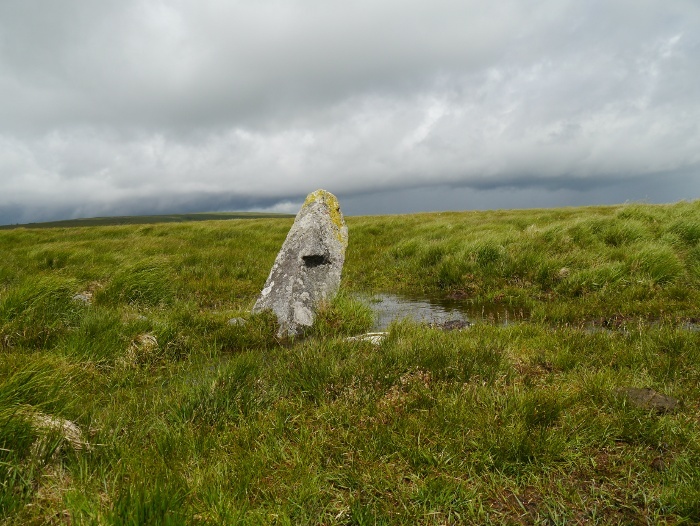 I continued plodding up Cut Hill and probably more through luck than skill managed to locate the old Peat pass, marked by a plaque on a stone. At that moment the weather came in, visibility dropping rapidly and heavy rain blown along on a strong wind. It was an unpleasant trudge to the top of the desolate hill. On the summit the rain continued with particular vigour, hard enough to be felt through my waterproofs. Poor old Reuben did not know what to do with himself. An unhappy little dance, a whimper then he attempted to make himself as small as possible against the soggy onslaught. On the way to Fur Tor the rain stopped and the mist lifted. Being a dog, Reubens misery was soon forgotten and he was once again trotting along happily with his tail wagging. 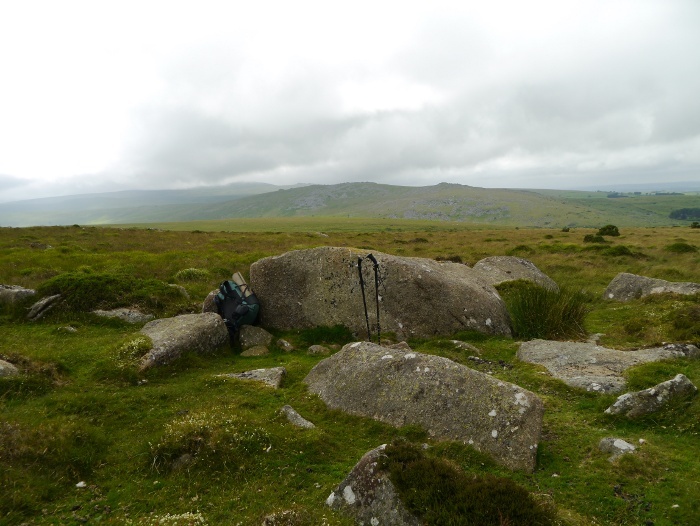 The ground between Cut Hill and Fur Tor was particularly rough and boggy and it took what felt like an age to reach the collection of rocky tors. The effort was worth it however, what a spot! 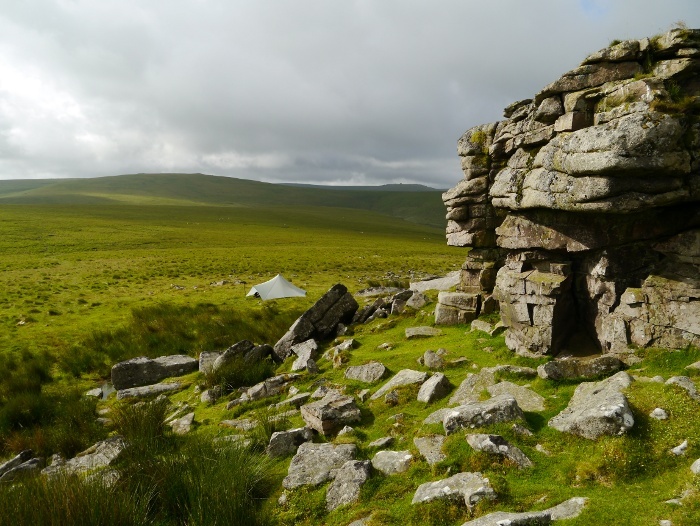 Fur Tor has got to be once of the wildest places on Dartmoor, a real feeling of being in the middle of nowhere. An isolated hard to reach place. A couple of backpackers were sheltering behind the main tor when I arrived and I chatted with them for a while. 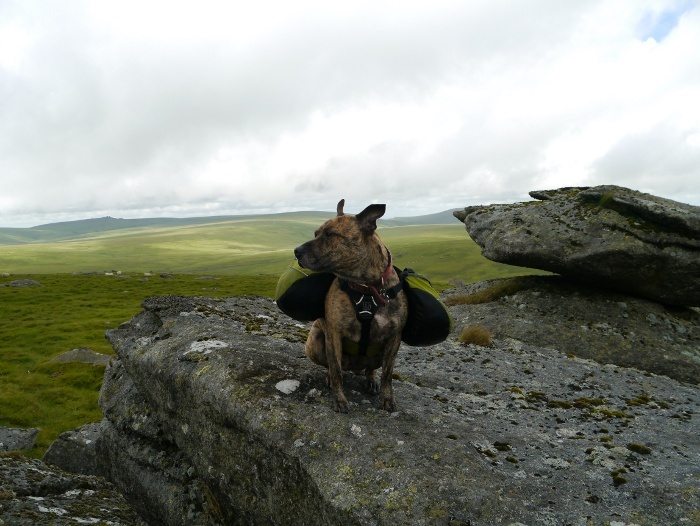 Unfortunately their small terrier took a disliking to Reuben so I had to relocate to another tor to seek shelter. I spent a while wandering around and taking photos. I will have to return one day for a wild camp as it’s a truly magical place. 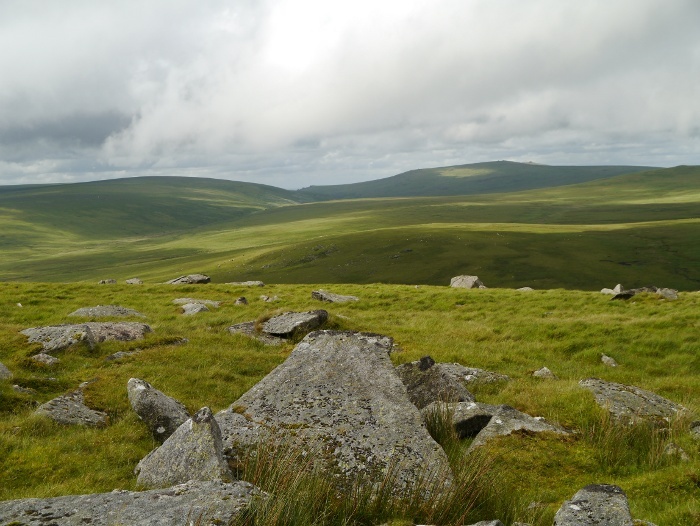 The northern slopes were pretty rocky by Dartmoor standards, although progress was quick down the short-cropped grass. 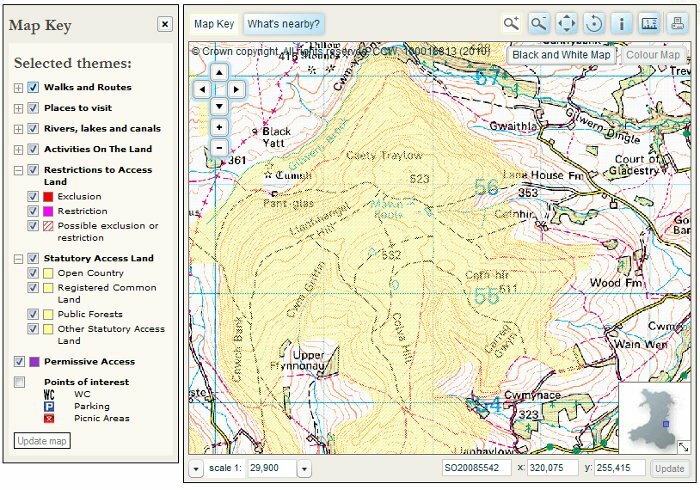 Cut Combe water was a pleasant grassy bowl with plenty of wild camping spots available. I pushed on however as I planned to spend the night at Lints Tor. After Little Kneeset the going became rough and boggy once more. The grassy moor was saturated and it was like walking on a huge soggy mattress. With dark clouds racing past it was pretty glorious in its grimness! 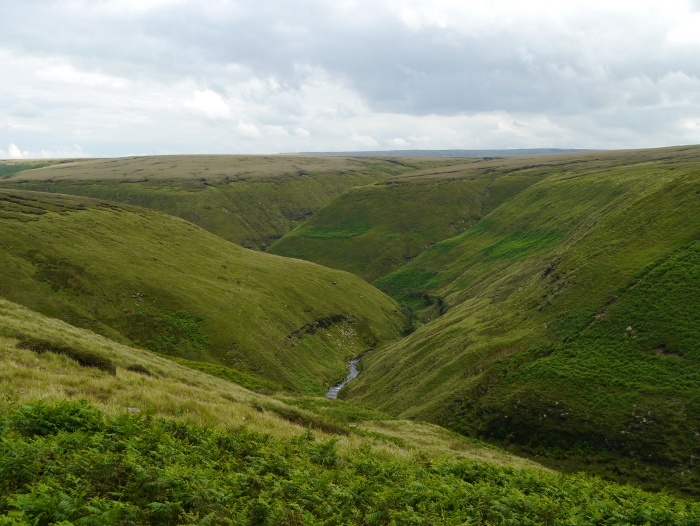 We descended towards Brim Brook at the point where it turns north. 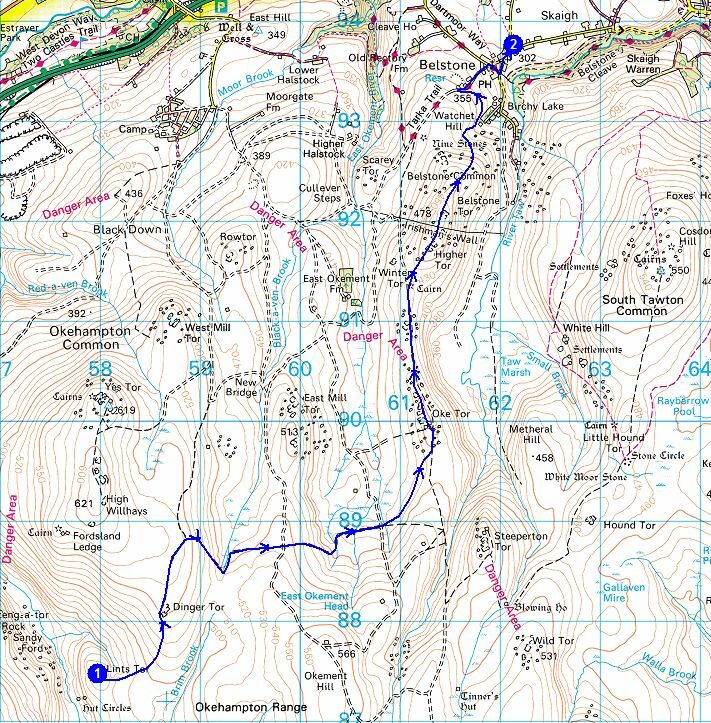 I had not given its crossing much thought to be honest as it is a small stream on the map. However all the rain over the past couple of days had turned it into a raging torrent. Using my poles it was evident that it was waist deep in places, the sheer force of the water making any attempt at crossing potentially lethal. The source of the stream was only a mile or so away so we headed along its bank on the look out of any potential crossing points. A few hundred metres upstream it split and we got across the first crossing, although still with some difficulty. The main channel was then tricky to approach across saturated bogs and I lurched about through the reeds and tussocks. 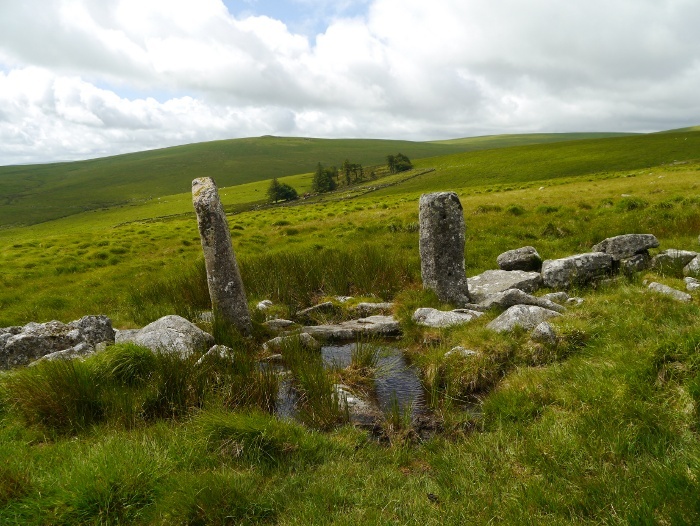 Finally we got across and it was a short splash across the moor to Lints Tor. There was not much shelter to be had but I managed to find a pitch on a flattish bit of ground wedged between two of the largest cow pats I have ever seen. A further weather update text from Corrina promised a sunny evening. 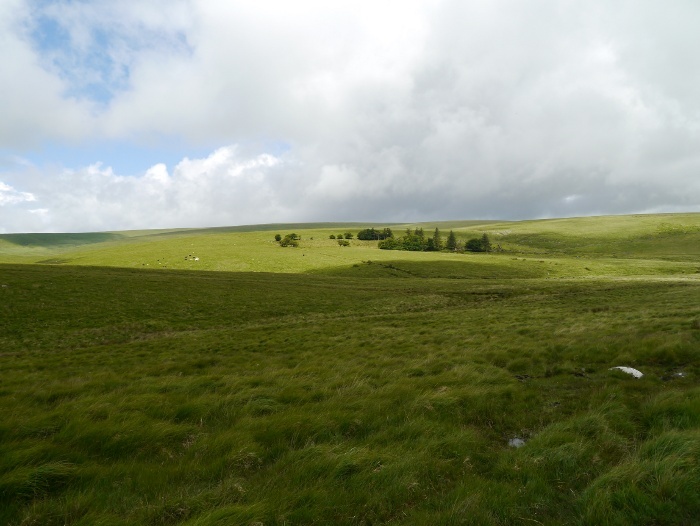 However Dartmoor had different plans and the rain continued to fall in heavy showery bursts throughout the night. Reuben however did get a treat and was allowed to curl up with me inside the Oooknest, rather than being relegated to his mat in the porch. 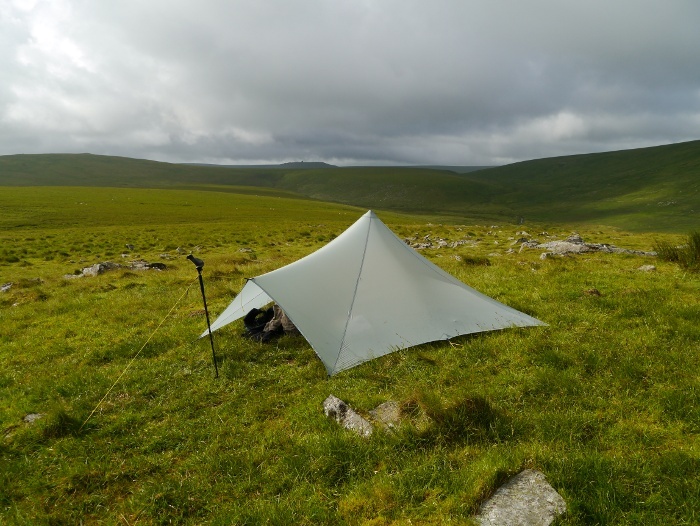 A brief sunny interlude in the morning gave me a few minutes to pop out of the Trailstar and take some photos. 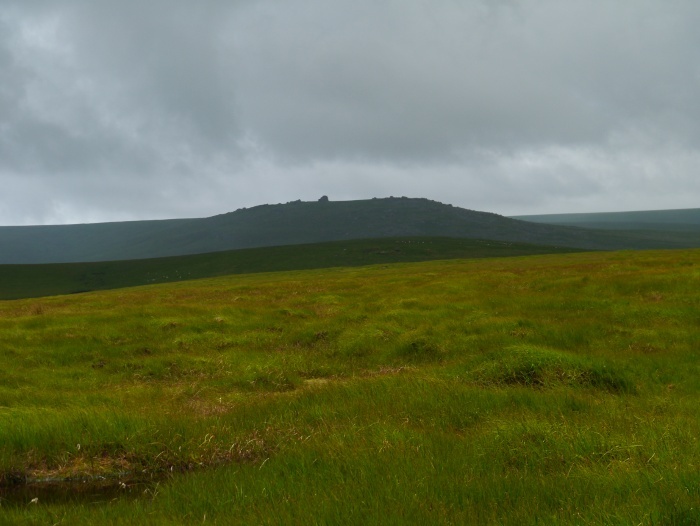 I had spotted Lints Tor during my week on Dartmoor the previous year and I had earmarked it as a wild camp spot. It was an excellent location, unfortunately let down by the less than clement weather. Once again within seconds the weather deteriorated and I dived back into my shelter. The surrounding hills were quickly enveloped in a thick mist and the rain beat on the nylon above my head with renewed intensity. As I was packing up inside the shelter I noticed four people on the opposite side of the valley walking aimlessly around Dinger Tor. They were still there twenty minutes later when I had finished packing, the clouds chased away by strong sunshine. Half an hour later as I reached Dinger Tor they were still on the hillside, all crouched in a circle looking intently at something on the ground. I resisted the temptation to walk over and ask them what they were doing. Dinger Tor marks the end of a track and I was soon making swift progress in an easterly direction, cutting across the grain of the land. 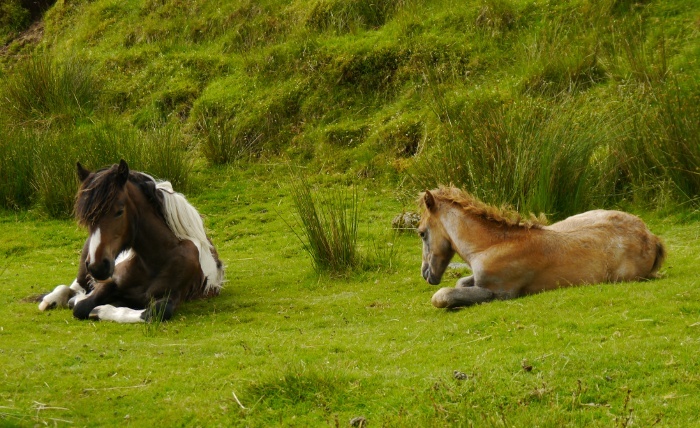 I left the track to start climbing Oke Tor and passed two ponies with their foals in a grassy sheltered hollow. 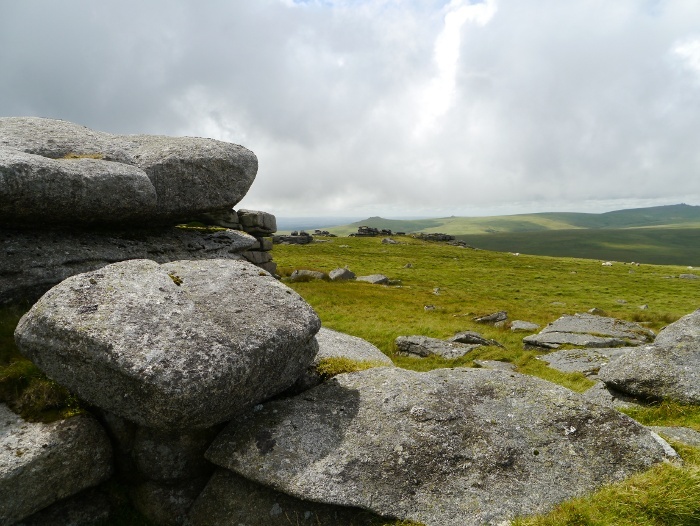 Oke Tor was a pleasant spot to sit for a while, its summit tor providing shelter from the wind. Considering that it was a summer Sunday in a national park I was surprised at just how quiet the hills were. 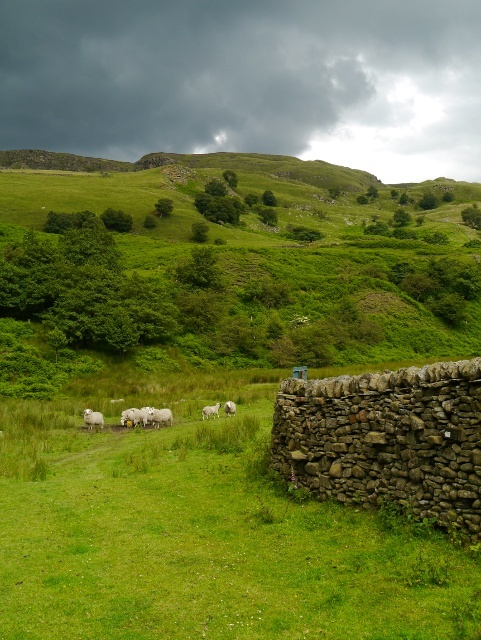 If I had been in the Peak District the hills would have been busy come rain or shine. 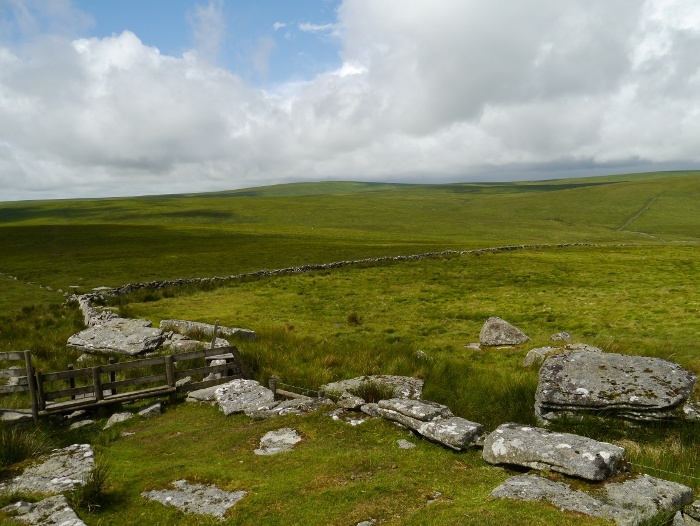 A good firm path led directly to Belstone Tor and I could not resist stopping and looking back towards the large open bowl that holds Taw marsh. From the lofty vantage point I could make out several spots along the river Taw that looked like they would make excellent wild camping pitches. North from Belstone Tor the ground drops away steeply and it feels like most of Devon is at your feet. Easy paths led quickly down to Belstone itself, still quiet even though it was Sunday lunchtime. I was glad to get to the car and change out of my sodden footwear and filthy trousers. Feeling tired after a weekend in the hills the long drive back up the M5 was less than appealing.